How to win an iPad by referring Friends to Zenofon : Prize Giveaway | Free Pc to Phone Calls, Free Voip Calls to India International ! Remember the innovative voip provider Zenofon, which rocked the voip market few months back. Zenofon made great news when it launched its invitation voip service and offered some amazing trial credits. Zenofon started with offering free credit worth $6 to test their service. Many of our blog readers joined Zenofon and loved the service. Another great feature which Zenofon offered was referral based service. Initially, people were allowed to join only when they got some invite. Zenofon service works by offering forwarding numbers that you can use to call your friend’s international phone numbers at a much cheaper rate without being connected to the internet. 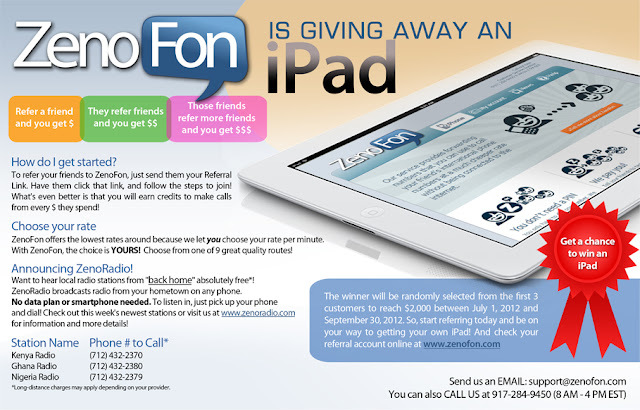 Zenofon has launched a new offer by which its users have a chance to win an iPad! This promotion requires that you refer your friends to Zenofon.When you refer a friend, you will earn $1 (plus your friend will get free credit to test Zenofon). When your friends refer their friends, you again earn more credit. Its like a referral tree! If anyone joins ZenoFon because of your referral, even 50 people away, they will credit your account. Register with the service and create a free account. Test with free credit. You will get a referral link. Forward this referral link to your friends and earn some credit. The winner will get selected from first 3 customer to reach $2000 between July 1 2012 to September 30, 2012. Still Confused..about this Zenofon promotion ? Check this info-graphics. Use Facebook to post your referral link. Just post it as your status! Post the referral link on twitter! Post your referral link as signature on various forums. Let us know your referral link and we will feature it here on this post. Post it in the comment section, with your name and link.